Goal: The specific aim of this initial pilot study was to assess whether a supplemental parenteral nutrition strategy delivered increased energy amounts to ICU patients with either confirmed or a high likelihood of enteral nutrition insufficiency, without significant adverse effects, when compared to a standard enteral nutrition strategy. Rationale: Early initiation of enteral nutrition (EN) improves clinical outcomes in critically ill patients and the provision of EN is now established as an important aspect of management in most Intensive Care Units (ICUs). Many studies have demonstrated that patients often receive insufficient amounts of their predicted nutrition requirements (i.e. underdosing) from EN for reasons which include delays in commencement, intestinal dysfunction, and the need to withhold EN for concurrent medical procedures. 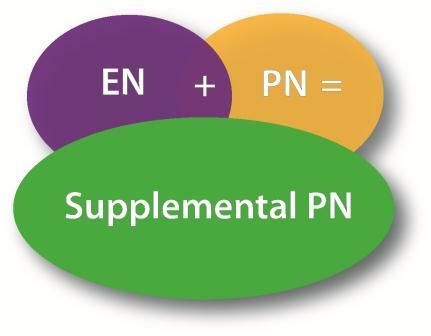 Because EN leads to insufficient nutritional intake, the early commencement of PN as a supplement to EN would seem a useful solution to increasing this amount. Clinicians were unable to make sound clinical decisions about the role of supplemental PN as guidelines provided conflicting recommendations, mostly because few studies had addressed this issue. The delivery of PN to critically ill patients risked overnutrition, which could lead to increased metabolic stress, hyperglycaemia and derangements in liver function. Energy intake needs to be carefully administered in conjunction with adequate blood glucose control to prevent these potentially detrimental effects. Hence, it was imperative that studies were conducted to identify patient populations that may benefit. Ridley EJ, Davies AR, Parke R, Bailey M, McArthur C, Gillanders L, Cooper DJ, McGuinness S. Supplemental parenteral nutrition versus usual care in critically ill adults: a pilot randomized controlled study. Crit Care 2018;22:12. Funding: An unrestricted grant from Baxter Healthcare. Contact: For further information about this study, please contact the ANZIC-RC Nutrition Program Manager, Emma Ridley, by email.